The first turf has been cut in the space by 4 South, paving the way to start work on our brand-new Milner Centre for Evolution, which is due to open in 2018. 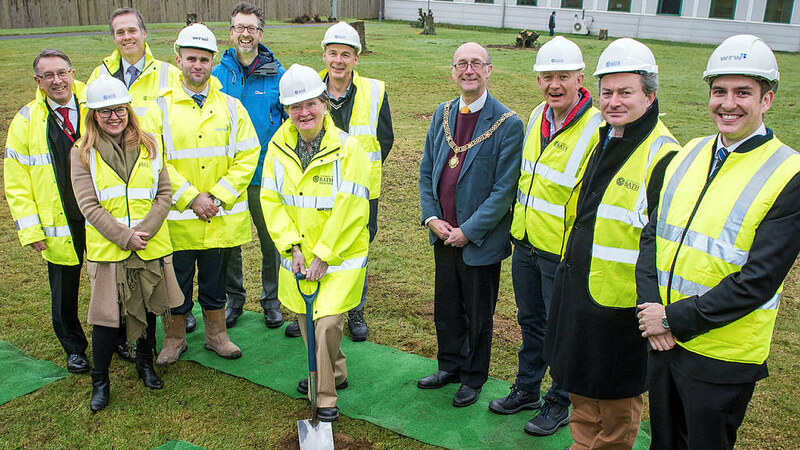 The Mayor of Bath, Dr Jonathan Milner and the Vice-Chancellor join members of the project team to mark the start of building on our brand new Milner Centre for Evolution. The Milner Centre, which will be the first of its kind for evolutionary science research, has been funded thanks to a £5 million philanthropic donation from Bath alumnus, Dr Jonathan Milner, who was present to mark the start of this exciting next phase in development. Tuesday’s event was an opportunity to set out the vision for the Centre towards shaping society’s views on evolution and its many applications. The first turf was cut by Dr Milner and President and Vice-Chancellor Professor Dame Glynis Breakwell DBE DL. Based within the Department of Biology & Biochemistry, headed by Professor Laurence Hurst, the Milner Centre will focus on three key strands: research that asks fundamental questions about evolution; impact that finds new technological and clinical applications for evolutionary science research; and outreach and public engagement about evolutionary science in its widest sense. Coinciding with the turf cutting event, significant new research funding from The Leverhulme Trust and The Wolfson Foundation worth £1.5 million was also announced for the Milner Centre. The team behind the Milner Centre has been in regular contact with local architects, Stride Treglown, and the remainder of the project team, as plans for the building have taken shape. Key to this has been ensuring that the research and wider activities have been front and centre of thinking throughout the design process. Helping it to achieve its objectives, the new building will boast a large central breakout space – the social heart to the Milner Centre – designed to encourage collaboration, deliver the outreach programme and give lectures. In addition, principal investigator and postdoctoral / postgraduate offices will be supported by new research laboratories, providing advanced research facilities. The building will also integrate patterning in the façades that reflect genome alignment describing the DNA code of various key organisms, providing identity and architectural detail to the building. Gary Milliner, Director at Stride Treglown, the architects behind the project, commented: “What’s been great about the design process for the Milner Centre for Evolution is Stride Treglown’s engagement with the University’s Biology and Biochemistry Departmental team. This iterative and enjoyable design dialogue has enabled us to deliver an exciting building design that creates a collaborative environment for researchers to gather and share ideas. The appointed contractor, WRW, is very excited about the opportunity to construct this building for the University. The Department of Estates look forward to working with WRW and the project team to deliver this milestone project.